Accademia Series There are 4 products. 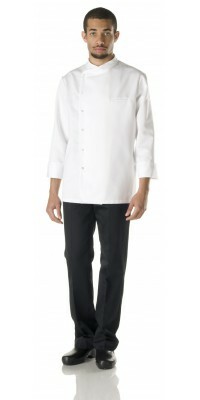 Corbara’s Chef Clothing: discover the modern Accademia series of Jackets with side buttoning. Dedicated to the kitchen brigades of the most modern facilities, the Accademia clothing series for chefs includes several chef's jackets with practical side buttoning, which creates an unpredicted and impressive look. - lastly the Simon Chef Jacket, a minimalist style with side buttoning and snap fasteners; available in black and white, is made of 50% cot. 50% pol. “cotton on the skin” Comfort Satin. 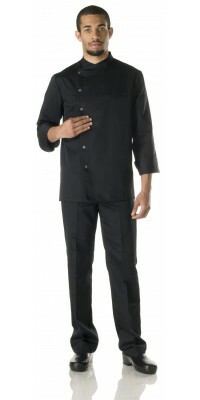 Chefs' Black jacket with side buttoning, model Accademia Grey profile on collar and cuffs Silver pull-out buttons - cotton on the skin Immediately available for delivery: sizes from S to XL Made of Comfort Satin, 50% Cot., 50% Pol. 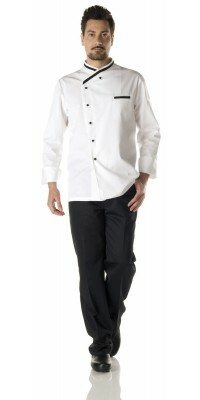 Chefs' jacket with side buttoning, model Alex White, with black profile in the collar - pull-out black buttons one black pocket on the breast and one on the left sleeve Immediately available for delivery: sizes from S to XL Made of Lightweight Soft-Feel Gabardine, 50% Cot., 50% Pol. 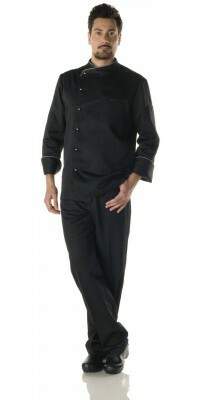 Chefs' Black jacket model Simon Side buttoning with snap fastener Immediately available for delivery: sizes from S to XL Made of Comfort Satin, 50% Cot., 50% Pol. "cotton on the skin"
Chefs' White jacket model Simon Side buttoning with snap fastener Immediately available for delivery: sizes from S to XL Made of Comfort Satin, 50% Cot., 50% Pol. "cotton on the skin"